The Australian Room with Martin Lloyd (porcelain expert at Roy’s Antiques). Roy’s first book was described as ‘antiques demystified’ and ‘a treasure house of information’ by reviewers. The second has been even more lavishly praised: Country Style (April 2000) observed, it ‘is like being led into a cosy den and regaled with humour and shivery insights into who we are and how it shows’ and Belle (Feb/Mar 2000) called it ‘a wonderful reference book’. 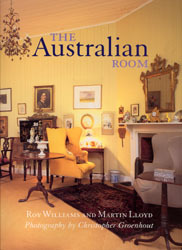 The large format colour photography and variety of real interiors shown aid the book in describing the forms and evolution of Australian rooms. The extensive text relies not only on wide reading but experience over many years in both antiques and decoration. However, the kindest and most flattering responses were from the National Trust (Victoria) and the Furnitex Committee. 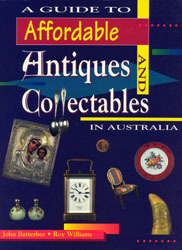 The National Trust were kind enough to include the book in their planning for their antique and home show in the Exhibition Buildings in Melbourne in 2000 and also the FIAA (furniture industry) exhibition: Furnitex 2001 where the concept of analysing rooms and decoration by decades has been adopted as a central part of the Furnishing Festival. A copy of The Australian Room, signed by both authors, is available for sale through this website at a cost of A$75 (Australian Dollars) plus postage and handling. As with all our stock, payment may be made by Visa, MasterCard or cheques in Australian or US dollars. We may be contacted via email ( mail@roys-antiques.com.au) or the details listed at the very top of all our website pages.